Our goal is to connect people with the best local experts. We scored wedding photographers on more than 25 variables across five categories, and analysed the results to give you a hand-picked list of the best wedding photographers in Santa Monica, CA. The lead photographer behind A La Mode Photo has more than 10 years of professional photography experience. The Santa Monica photography studio has been featured on Good Morning America, CBS The Early Show, and the Dr. Phil Show. The photographer mostly captures local weddings, but will travel all over the country. Clients have praised A La Mode Photo for its talented, professional photographer. Aevitas Weddings shoots photographs and videos of local and destination weddings. The Santa Monica wedding photographer has shot more than 300 weddings all over the world. The studio has photographed venues including ballrooms, beaches, vineyards, gardens, churches, and private estates. Clients have praised Aevitas Weddings for its professional, talented, and flexible photographer. Albert Postel Art of Photography has offered photography services to the Tarzana, California community for over 20 years. Photographer Albert Postel combines his European upbringing and passion for photography to take photos that tell a story. Multiple wedding packages are available, as well as custom designed packages to meet the unique desires and needs of clients. Custom created Italian weddings books are available to clients who choose to purchase one. A percentage of all sales is given to the Children in the Wilderness charity program. Albert Postel Art of Photography earned the WeddingWire Reader’s Choice Award in 2013. Besides weddings, Albert Postel can be hired to photograph portraitures, corporate events, and Bar Mitzvahs. Artistic photographs are available as limited edition prints. Clients appreciate Albert Postel’s professionalism and easygoing approach to photography. The founder of April Rocha Photography has been working in professional photography for more than 10 years. The Santa Monica studio's work has been published in The Knot and Grace Ormonde's Wedding Style Magazine, and has won the WeddingWire Brides' Choice Award. The photographer shoots local weddings as well as destination weddings. Clients attest to April Rocha's creative vision and professionalism. B&G Photography has been serving the Santa Monica area since 2003. The photography studio, based in Los Angeles, won The Knot Best of Weddings from 2012 to 2016 and the WeddingWire Couples' Choice Award 2014. The studio's work has been featured on Carats & Cake, Style Me Pretty, and Grace Ormonde Wedding Style. The photographers will photograph local weddings as well as destination weddings. Brian Leahy Photography includes a second photographer and full printing rights with all of its wedding packages. The Santa Monica photography studio sells custom albums and prints and will travel all over the world to photograph weddings. Brian Leahy's work has been featured in Reverie Gallery, California Wedding Day Magazine, CV Lux Magazine, Pottery Barn, Destination I Do Magazine, and other publications. Bumatay Studio offers full-day wedding coverage with two photographers, post processing, digital files, and a professional online gallery. The studio also shoots engagement sessions, lifestyle portraits, fitness photos, and bridal portrait sessions. Clients have given positive feedback for Bumatay Studio's friendly, professional, and artistic staff. Callaway Gable Studios uses a vibrant and modern photography style for its wedding photos. The Los Angeles-based studio will shoot local weddings as well as destination weddings. The business has won 65 international Fearless Photographer awards. Clients have praised Callaway Gable Studios for its professional, fun, and talented staff. Chelsea Elizabeth Photography is a photography studio founded in Newbury Park in 2006. The photographer uses a clean, crisp, and modern style in her work. The studio won the WeddingWire Brides' Choice Award in 2011 and The Knot Best of Weddings in 2011. 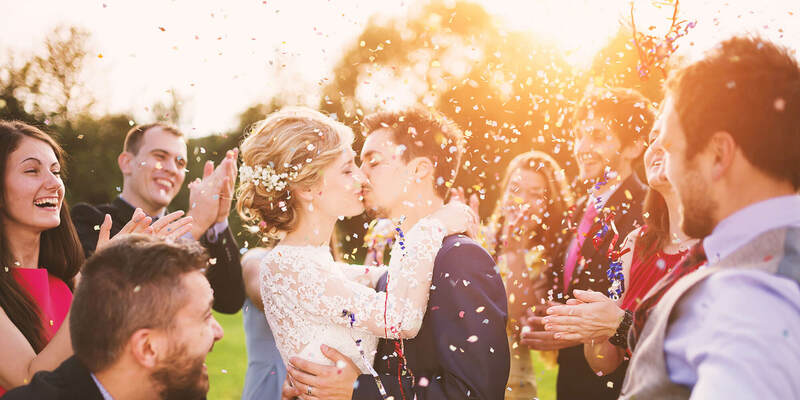 The business' wedding packages include a USB drive of high-resolution images, a blog post within six weeks of the wedding, online proofing, and an online slideshow. The founder of Embrace Life Photography has been shooting photographs since he was 15 years old. The Santa Monica photography studio provides add-on options such as canvas prints, handcrafted photo albums, coffee table portrait books, and other items. Clients have given positive feedback for Embrace Life Photography's beautiful photos and kind, dependable, and professional photographer. Josh Goodman Photography is made up of a husband and wife photography team based in Los Angeles. The photography studio gets its inspiration from classic Hollywood films and uses a photojournalistic style. The business has been featured on Style Me Pretty and won the WeddingWire Brides' Choice Awards in 2010, 2011, and 2012. Clients have given positive feedback for the studio's sweet, cooperative, and professional photographers. The internationally published team behind LA Budget Wedding Photographer photographs weddings, shoots videos, and captures engagement photos. The studio offers up to eight hours of event coverage, a USB with high-resolution images, and printing rights. The business won Best of Thumbtack in 2016. Clients have praised LA Budget Wedding Photographer for its photographers’ upbeat attitudes and fun, romantic photos. Next Exit Photography has been serving Santa Monica clients for more than 15 years. The photography studio, based in Los Angeles, has won awards including Best Wedding Photographers in Los Angeles by California Wedding Day Magazine 2014, Best of The Knot Magazine, and Huffington Post Most Magical Shot 2015. The studio’s work has been featured in InStyle magazine, Modern Luxury Brides California, B Magazine, Anhelo Magazine, and other publications. Renee Bowen is a mentor to photographers all over the country and the co-founder of SEEN Magazine. The Santa Clarita-based photography studio covers weddings for a half day or a full day and includes an online gallery and digital packages in its wedding coverage. Renee Bowen’s work has been featured on Rock The Shot, Seniorologie, Senior Style Guide, 100 Layer Cake, and other publications. Rob Greer Photography shoots Santa Monica weddings using a photojournalistic style. The studio also shoots engagements, portraits, and special events. The photographer’s work has been featured in The Knot, Harvard Magazine, The New York Times, Style Me Pretty, and Disney's Fairy Tale Weddings, and he has won multiple awards from Wedding and Portrait Photographers International. Clients have given positive feedback on Rob Greer’s punctuality, organization, and experience. Studio EMP is a studio based in Fullerton that shoots weddings and portraits. The photographer's work has been featured in Grace Ormonde Wedding Style, The Knot, Inside Weddings, Destination Weddings + Honeymoons, and Utterly Engaged, and he was named the Best Wedding Photographer in Orange County by California Wedding Day Magazine in 2014 and 2015. Clients have praised the studio for its fun and professional photographers. Stunning Bride Photographers' wedding package includes eight hours of wedding coverage, a wedding album, an engagement session, and digital delivery of images. The business also shoots proposals and engagements. The studio has been featured on The Knot and Martha Stewart Weddings, and won the WeddingWire Brides' Choice Award in 2015. Clients have praised Stunning Bride Photographers for its experienced, easygoing, and professional staff. The Big Affair Photography has been featured on WeddingWire Blog, Something Turquoise, Society Bride, Storyboard Wedding, Wedding Colors, and The Inspired Bride. The Los Angeles-based studio won the WeddingWire Brides’ Choice Award in 2013 and The Knot Best of Weddings in 2012. The photographers will travel all over the world for destination weddings. Clients have given positive feedback for The Big Affair Photography’s kind, friendly, informative, and professional photographers. The award-winning photographer behind Todd Johnson Photography specializes in wedding photography in the Santa Monica area. The photographer’s work has been published in National Geographic, Life, Vanity Fair, Sports Illustrated, Vogue, and other publications. The Culver City studio has won awards from the International Photography Awards, Lurzer's International Archive, Kodak, Cannes Lions, Adweek, Kelly Awards, IAAA, and World Medal. Clients have praised Todd Johnson for his friendly, attentive, and accommodating team. Yar Haim Photography’s wedding packages include professionally edited photos, high-resolution images, a private online gallery, and free travel within a three-hour drive. The photographer uses a simple, timeless, and photojournalistic style. The Los Angeles-based studio won The Knot Best of Weddings from 2014 to 2016 and the WeddingWire Couples’ Choice Award from 2014 to 2016. Clients have praised the photographer for his friendly, honest approach to photography.